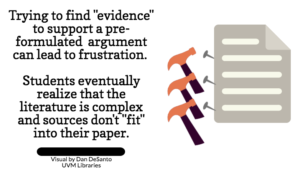 This is the first in an occasional series of posts by UVM Librarians that addresses information literacy and using library resources in teaching. Students often believe that research begins only after they have chosen a topic. Some even go so far as to write a draft paper before beginning their research. Deciding on a topic usually feels like a relief to students. But deciding too soon and without first looking at the literature can set students up for later frustration and the feeling that they’re doing something wrong when research turns out to be more difficult than expected. It can also limit students’ learning if they immediately become focused on finding material to prove predetermined points. Instead, we want students to approach the research process with an attitude of open inquiry that allows them to learn from what the literature has to say1. With some simple but important adjustments to syllabi and assignments, we can help students understand that good research is an iterative process, that attempting to answer a question often leads to more questions, and that a research topic may change over the course of a project. 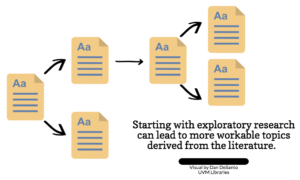 In your syllabi and assignments, use language that indicates research is an iterative process. Explicitly tell students that you expect their topics may change over the course of a project as they learn more about them. Rather than asking students to find literature to prove a point, make assignments that encourage students to approach the literature with an open question. Ask students to notice if there is convergence or dissent around a topic, and allow for the possibility that some (many?) questions may remain unanswered. Tell students it’s normal to have feelings of uncertainty and confusion at the beginning of their research process. Invite them to think of themselves as explorers heading out to sea and talk with them about the characteristics and behaviors of good explorers: bravery, curiosity, flexibility, patience and tenacity. Tell them about your experiences with your own research projects. Ask students to generate two or three potential topic ideas, and require students to do some exploratory research on each before selecting one. The goal of the exploratory research is to test the viability of each idea and to uncover interesting and previously unknown aspects of the topic. It will also help students determine if an idea requires narrowing or broadening to fit the scope of the paper or project. It doesn’t make sense to attempt a 25-page paper on the confidential marketing strategies of an obscure private company. Conversely, “global warming” is too broad for a short five-page paper. Librarians can be allies in this process. Reference and instruction librarians can work with you to create or adjust assignments to encourage exploration and inquiry. Feel free to contact your liaison librarian. Reference and instruction librarians also are accustomed to helping students explore and select topics. Invite your students to meet with a librarian—either at the reference desk or in an individual consultation—to do some exploratory searches in various databases. Librarians also can point students to high-quality topic overviews such as subject-specific encyclopedias and current affairs reports. Browsing these can stimulate ideas and provide clues about the extent of information available about a topic. We are thrilled that one of our CTL Faculty Associates, Dr. Annie Murray-Close, won the 2018 George V. Kidder Outstanding Faculty Award! 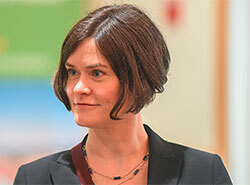 Annie is an associate professor in the department Psychological Science. She’ll present the George V. Kidder Lecture, “Sugar, Spice, and Everything Nice? Understanding the Development of Relational Aggression in Girls,” on Tuesday, October 30, 2018. Read more and register on the UVM Alumni Association website. Screencasting is a technique that allows you to record everything that happens on your computer screen then turn that recording into a video. Not very exciting, right? But think about all the things you do on your computer. More importantly, think about what you do on your computer that you would like to show to, or share with, others. What can you put in a screencast? Just like a movie trailer, a course trailer can help generate interest from prospective students to your course. Or, you can create a trailer for the students who have already enrolled. The trailer could lay out the goals of the course, the expectations, the organization, the workload, or any special activities. See Duke University’s “Best Practices: Creating Video Course Trailers” for samples and more information. Even the most well-organized Blackboard course can leave students without a clear idea of where they should begin or what, exactly, the course contains. A course tour video can help guide students through the course in the early days and, especially for those new to the field, act as an introduction to the terms used, and conventions followed, in that field. Whether it’s working through a math problem, graphing an economic calculation, analyzing lines of computer code, or pointing out important facets of a work of art, a poem, or a musical composition, showing is often better than telling. A screencast can walk a student through a process rather than simply showing a result. Here’s an example of how to calculate the area of a triangle. A screencast can be used from semester to semester to explain perennially difficult concepts or to address common questions. For example, here’s Bonni Stachowiak’s video that shows her students how to create a quick bibliography in the citation program Zotero. Some versions of PowerPoint allow you to narrate a slideshow and save it as a video, but there are some compatibility issues between Mac and Windows v ersions and editing that sound is not easy. You can, instead, screencast your slideshow while you narrate it. This gives you a soundtrack that is easier to see and edit in the screencasting program (take out the ums and ahs!) and it will be compatible on either Mac or Windows. Screencasts do not have to be cinematic masterpieces. Students appreciate the authenticity of your voice. This screencast checklist checklist can help ease the process and give you good results in a short amount of time. Screencast-o-matic: There is a free version that allows you to capture but not edit. We recommend instead that you get the “Pro” version which costs $18 a year. To learn more about screencasting, see our CTL Screencasting page or come visit during our Open Hours. Some content for this article was adapted from a submission to the Teaching Tips Consortium of the POD Network by Judy Ableser, Director Center for Excellence in Teaching and Learning, Oakland University. For many years, a major part of my staff role was supporting first-generation college students. 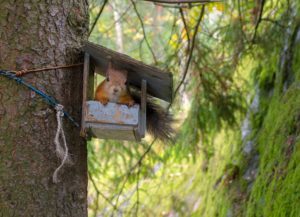 Often, when I’d suggest students visit faculty during office hours, I would be greeted with a blank stare or sometimes even the air of panic. Research shows that relationships with advisors and other staff and faculty on campus is integral to student retention and success. One critical way these relationships are built is through office hours, which allow for more informal interactions and where a significant amount of academic and professional mentoring occurs. However, it’s valuable to remember that office hours are a new phenomenon to many students. Most high schools don’t have such a structured way for students to connect with teachers. And, students may feel more intimidated by their college professors, uncertain about how to engage during office hours or even why to go. While the value of student/faculty relationships has been well-documented, it is imperative to remember that students success is driven when faculty are responsive, supportive and accessible (Kuh et. al., 2010; Tinto, 2012). Interactions during carefully advertised and facilitated office hours can be one bridge to help build these important connections and reduce the fear factor some students may experience regarding interactions with their professors. Include both set office hours and “by appointment” to accommodate students who cannot attend during scheduled time. For online courses and for students who have difficulty meeting during set times, offer virtual office hours using Skype or Zoom. 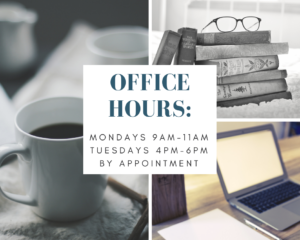 Hold your office hours at the Davis Center, Library, or in other central locations (students may feel intimated to come to your office). Divide the class into groups of 4-5 and assign them a time to come and visit you in your office. This can be a short (10 minute) introductory meeting. This may help “break the ice” so the students are more comfortable to come back when they need help. Reach out through a personal email/text, early in the semester, to students who are struggling, and invite them to meet with you. When students do come, provide them prompts and questions so they can articulate their needs. 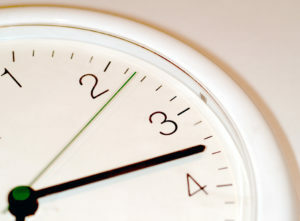 Remind them of how much time you have for the meeting and give them reminders a few minutes before it is time to leave. Have candy, snacks, or coffee available if possible. What other suggestions do you have for building productive relationships with your students? Kuh, G., Kinzie, J., Schuh, J., Whitt, E. (2010). Student success in college: Creating conditions that matter. San Francisco, CA: John Wiley and Sons. Tinto, V. (2012) Completing college: Rethinking institutional action. Chicago, Il: University of Chicago Press. Are effective group work assignments possible? We know that valuable transferable job skills are learned during group work and students can learn from each other and develop the skills they need to practice. Planning ahead and getting the groups functioning well over the span of a longer assignment is the key to success. Link your course learning outcomes to the group work assignment. This helps students understand the purpose of the group work. They know they aren’t doing group work just to do it. Provide very clear directions for each task of the assignment. And allow some choice, if possible, on topics or options for the presentation at the end. To ensure fair grading of all group members, give both a group grade and an individual grade and include this within the points structure for the assignment. Assign due dates and points for each increment of the assignment. Group work assignments can be engaging and fun for students and for faculty. It’s great to see what the students come up with for results. So, be creative and clear with the assignment options, allow for assessments along the way toward the final product and enjoy the process. Posted in Pedagogy, Teaching	| Comments Off on Are effective group work assignments possible? User Unavailable: the student has dropped the class or become inactive. Column Not Visible to Users: students will not see their grade in MyGrades for this column. Completed: A Survey or other activity has been completed by the student. Needs Grading: Student work, for example an Assignment or an Essay Question in a Test, is waiting for you to grade it manually. Override: You (or your TA) has overriden a previously given grade, either to make it lower or higher. Attempt in Progress: Student is still working on it (example: they are in the middle of taking a Test). External Grade: The Total column carries this designation by default. It is designed especially for K-12 where a teacher may want to share a grade with the student’s parent or guardian. We do not use that feature, but if you want to delete the Total column you must set another column to carry the “External Grade” designation before you can delete the column. Choose a different column to carry this designation by selecting “Set as External Grade” option in the drop-down menu for that other column. Once done, the Total column will be freed up and you will find “Delete Column” as an option in its drop-down menu. Grade Exempted for this User: You or your TA has chosen to Exempt this grade, i.e. not include it in the calculations for that student, by clicking on the cell for that Grade and choosing “Exempt Grade” from the cell’s drop-down menu. Does not contribute to user’s grade: Typically you see this icon when you have set an Assignment or Test to allow for multiple attempts. You must designate which single grade should be counted (ex: the last attempt, the highest grade attempt, the first attempt, the lowest grade). This icon tells you that the student made other attempts and received other grades for this specific activity. Error: Means what error always means–an undefined problem has occurred! Not participating: The student is not participating in , or has been exempted from, this activity. For example, the activity may have been created for a specific group but not for the entire class. Anonymous Grading is enabled for this item: You may add a layer of impartiality to your grading so that you aren’t unduly influenced by a student’s previous performance, past participation, race, gender, or perceived student aptitude. This summer, I revisited the excellent book Discussion as a Way of Teaching: Tools and Techniques for Democratic Classrooms by Stephen D. Brookfield and Stephen Preskill. I’d like to share some key ideas from their text (and encourage you to check out the book from the Bailey/Howe collections). I should note that the ideas and approaches shared in this book can be applied in classrooms with a range of size and content areas. Even in a large course, there are opportunities for students to simply pair with a neighbor and engage in a discussion. After all, according to the authors, discussion is “an alternatively serious and playful effort by a group of two or more to share views and engage in mutual and reciprocal critique” (Brookfield & Preskill, 2005, Chapter 1, Section 2). To unpack the definition a little further, there’s something lovely about being given the expectation of mutuality, when opposition and polarity seem to inundate the airwaves. To be clear, in a discussion, while opposing ideas may indeed emerge, perhaps with no consensus reached, by Brookfield and Preskill’s definition, the people engaged are doing so with the common intent of learning and growing by listening, thinking, and articulating. to act as a catalyst to helping people take informed action in the world. (Brookfield & Preskill, 2005, Chapter 1, Section 2). What I appreciate about these purposes is the challenge they provide me, as a teacher, to create opportunities for my students where the discussion is elevated and potentially transformative. Please do recognize that I use the word “challenge” with all honesty. Facilitating discussions that meet these purposes is not always easy. Fortunately, Brookfield and Preskill provide more than a philosophical perspective. They also share numerous techniques and approaches, from setting expectations to navigating the complexities that social identities (race, class, gender) bring to participating in discussions. What’s the most contentious statement you’ve heard so far in the lecture today? What’s the most important point that’s been made in the lecture so far? What’s the most unsupported assertion you’ve heard in the lecture so far? Students are asked to keep track of points of consensus or disagreement. Then, the instructor asks (in the full group) for a representative sampling of comments. Ask a question or make a comment that shows you are interested in what another person has said. Instructors could come up with any moves they would like. It is recommended that time is saved for the end of class to hand out the full list of questions and debrief the experience. Brookfield, S. D. & Preskill, S. (2005). Discussion as a way of teaching: Tools and techniques for democratic classrooms [Kindle version]. Retrieved from Amazon.com.